When I started my law firm back in the dark ages, a desktop computer and laser printer, telephone (remember what that is?) and Word or Word Perfect (for generating documents) were indispensable tools, along with business cards and a couple of legal pads. Laptops were still really expensive and still a bit of a luxury though without one, I was confined to working in my damp, dark basement where our home computer was located, without any confidence that I’d ever get my firm off the ground. Fortunately, my husband believed in me before I believed in myself – and bought me the $1500 laptop that took me out of my basement and into the world. With the laptop, I could work from the Library of Congress or one of the cubbyholes in my virtual office where I met other attorneys and a year later, I was on my way with enough clients to afford a full-time space where I’d spend the next decade. That laptop wasn’t really a “must-have” purchase – I probably could have plodded along, making due on the desktop in the basement until I found clients who paid the bills. But in retrospect, it turned out to be a game-changer if only because it served as a constant reminder of my husband’s faith in me. Likewise, many of the tools included in the guide listed below, while eminently practical aren’t indispensable to starting your firm. But they’re nice to have and could, like my laptop, propel you in a direction that you never expected or simply make your life a whole lot easier – especially if you’re starting out from home or a part-time co-working space. So, if you plan to make 2019 the year to start your law firm (you can view the replay of last week’s webinar here), consider putting some of these items on your gift wish list. Disclosure: all links to Amazon products are affiliate links; other links are not. As I wrote here, I’m a big fan of the Chromebook, which is a machine designed to be used primarily while connected to the Internet, with most applications and documents living in the cloud. But in contrast to iPads and tablets which are similarly Internet-dependent, Chromebooks have a full screen and keyboard so they’re more functional plus they cost a lot less. If you work from home or out of coffee shops or travel a lot, a Chromebook is a dependable work companion. I purchased this Acer Chromebook a couple of years back when I traveled out of the country and still take it with me instead of my laptop on short trips. But if you’re looking for something even lower in price, check out the Dell Chromebook or Samsung Chromebook which are both under $170. As law practice becomes digitized, many attorneys no longer have much need for a printer. In my practice, although I have access to a common printer located in the common area of my space, I prefer to keep a small printer in my private office for smaller jobs. I use something similar to the HP Laser Jet Pro , though if you anticipate having to make color copies, you might consider the HP Laser Jet Pro . For large projects like briefs, I outsource production. There are also several types of special-use printers for different purposes that are as useful or more so than a conventional printer. The portable HP Sprocket will print tiny photos on the go, while the Canon Pixma works for mobile printing. Finally, many lawyers swear by the Dymo Label Printer for everything from file and mailing labels to printing postage. As recently as three years ago, a workhorse scanner was an integral component of a paperless practice. Not so much anymore — at least for a national or federal court-based practice like mine where most of the documents that I receive from clients or the court are already in electronic format. Still, for many other types of practices, lawyers still deal largely in paper and therefore need a powerful scanner to digitize paper as soon as it comes through the door. The Fujitsu iX 500 SnapScanner has long been the gold standard for lawyers – and in fact, it’s the version that I used for almost a decade until I no longer had a need for a scanner. Of course, there are other of scanners — some reviewed here that are less expensive. Still, if you’re going to be doing a lot of scanning, the Fujitsu is the way to go. For occasional scanning or scanning on the road, you can use your phone (I use the Genius Scan app on my iPhone) or an inexpensive portable scanner like the Brother Mobile 620 which is $79. What to do after you scan paper copies? Check to see if your malpractice policy or retainer agreement requires you to retain originals. If not, then send those copies through the shredder . If I were starting out today, I would purchase an AI or Voice Assistant like the Amazon Echo or Google Assistant and incorporate both tools into my practice and workflow from the get-go. Why? Because sooner than we realize, most consumers will come to depend on AI-powered bots and Alexa and Siri and similar tools to help them make decisions about what products to purchase and even what lawyers to hire . In order to understand how consumers will use these tools in the future, it’s critical to get out in front and use those tools yourself. And there’s no better way to get a head start than by incorporating tomorrow’s tools into your practice today. Right now, the Amazon Echo (which I use at home) holds the lead for legal business integrations, synching with some practice management platforms for time tracking and performing other business tasks . That said, be aware of stories like this one that raise concerns about confidentiality of AI assistants. As confidentiality issues sort out, tread cautiously, but that’s no reason to avoid AI assistants. Instead, employ them to operate appliances, create Flash Briefings for clients (like legal marketer Nancy Myrland ) or just listen to music or audio books to the work environment a little more pleasant. Sometimes, online security breaches originate offline – either through employees using a computer that doesn’t belong to them or cleaning crews rifling through your desk after-hours in search of passwords or financial data. The Amazon Security Cam – which works with Alexa – lets you keep an eye on what’s going on even when you’re not around. For sedentary lawyers who spend much of the workday sitting, standing desks offer real health benefits. If you have your own office or unlimited space, you can purchase a desk that can adjust to standing height – there are many options though some can be costly. Still, you can experiment with a standing desk with less commitment by choosing an elevated desk that mounts on top of your existing desk. One such option is the Innovadesk which sits atop your existing desk, and convert it into a standing desk. The Innovadesk is large enough to support dual monitors. Another option is the Standing Desk Elite – it will hold only one monitor but no assembly is required. If you work in a part-time co-working space (as opposed to one where you have a full-time office or dedicated desk), chances are that you are working off a laptop and sitting at a desk that you can’t adjust to suit your comfort. That’s where a laptop stand comes in to play: you can adjust the height to make it more comfortable – or, play around with the angle for a more flattering view if you’re participating in a video call or broadcasting a Facebook live. Two of the stands that I see most commonly in the office where I work are the Lamicall Laptop Riser and the Macally Laptop Stand for Macs. If you work on the go or at a virtual office or co-working facility where you don’t have a dedicated space, this foldable laptop stand is fully portable so you can take it along on the go. Back when I split my time between a part-time virtual office and home office, I remember how difficult it was to always be on the go. I didn’t have a car back then nor did Uber or rideshare services exist – so I’d cram my laptop, dress shoes and lunch into my briefcase (if they fit) or an old backpack and lugged it all downtown on the metro. These days, I have a space to call home, but starting out, that may not be true for you – and these suggestions can make a nomadic professional life — bouncing from spot to spot each day — a little easier. First, though briefcases are nice, they weren’t intended to carry the kitchen sink. Instead, invest in a rolling laptop or trial bag that you can use for court but also just to haul your belongings. This Perry Ellis laptop bag seems spacious, as does this Samsonite Wheeled Catalogue Case – and both will allow you to carry your office along with you with ease. Another lifesaver that I always have on hand no matter where I go is the humble power strip . For a tiny investment , you can ensure that your computer and phone are always connected – while connecting with others around you. For the same reason, I also like having a powerful charger along with me which I can share with others when their batteries run low. Although the MyCharge Hub can be a bit fragile (I’ve had the plug break off or the USB connector snap on past models), I’m still a fan because of its long lasting and reliable charge. 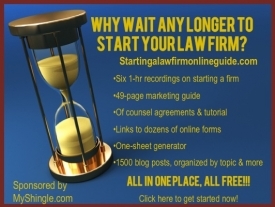 Back when I started out, lawyers marketed through websites and later blogs. I launched my website in 1996, well ahead of the wave, and kept out in front with my blog. Today, podcasts are growing in popularity as too is video. Lawyers starting a firm today should be poised to leap on these trends as I did back in the day. And one way to do that is to be prepared by having the equipment you need a podcast or video at your fingertips. Fortunately, neither podcasting nor video casting (or v-logging) requires much in the way of investment. Good quality sound is necessary for a podcast or video – I like my easy to use Snowball mic (I used it for webinars) but the gold standard is the Blue Yeti . In addition to good sound, video also requires a well-lit room (nothing less professional than looking like a lawyer from the Blair Witch Project ). Reasonably priced lighting options include Limo Studio – both affordable and easy to set up and break down. To record a video, you may not want to be tied to your desk. A phone works better – most phones have great resolution and you can use your phone’s headset to improve the sound quality. Another benefit of video recording on your phone is that you can move to a better lit location if you haven’t purchased lights – and also sit, stand, walk or assume whatever position makes you feel most comfortable. To do that, you’ll need to set your phone up on a tripod or use a selfie stick: the Youzon selfie stick and tripod will work for desk top filming; if you need a taller tripod, check out the Flexible Tripod and Selfie Stick for Vlog and Videos. Folding Bookcases Bookcases like this Easy Assembly Bookcase or these ladder bookcases were a lifesaver – quick to set up on my own and ensuring that I always had enough storage space without having to stack milk crates like a college kid. Ottomans Ottomans also offered a great way to contain larger messes – like stacks of paper exhibits or 3000-pages of appellate records before e-filing was a thing. The Beleze Tufted Gray Ottoman and Avalon Rectangular Faux Leather Ottoman are affordable and functional, providing storage space that can be pushed up against a wall – and double as a bench where the kids to hang out. If you tend to work closer to the family room or on the couch, you can stow your laptop and belongings in something like the Burlington Leather Ottoman . Room Dividers I always found that room dividers came in handy to both stake out my territory and hide my mess from guests. I used fairly generic screen dividers like these which worked fine though they were a bit flimsy. Looking around Amazon, I found the Diamond Room Dividers which look sturdier and more functional because they have built-in mini-shelves, and also these Chalkboard Dividers where you could jot down notes or let your kids decorate while you’re working. Printer Stand and Storage You may not have much real-estate on your home-office desk if you’re using one of the stand-up desktop options mentioned earlier, or if a small desk was your only option. A printer stand and cabinet like the Little Tree Printer Stand and Storage will help preserve that precious desk real estate and also keep supplies and paper away from little hands. Are there any office products that you’d like us to include on the list based on your experience? Please post a link in the comments and share your recommendations. And there’s more to come…tomorrow stay tuned for the eclectic list of book recommendations to teach and inspire you on your journey to making 2019 the year that you start your law firm.